If you rate great food, lower prices, and an amazing atmosphere over ski-in ski-out convenience, then the Dolomites is the place for you. The Dolomites is without doubt one of the largest, prettiest, and most queue-less ski networks in the world, boasting several different ski areas with 1,220km of sun-kissed slopes all under one lift pass. From the glamorous resort of Cortina d'Ampezzo to the quaint resort of Arabba, the Dolomites offer skiing tailored to all the family. 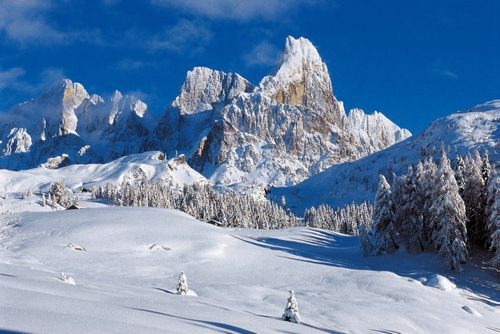 A highlight of the region is skiing the renowned Sella Ronda: a 40km circuit of spectacular views and groomed pistes, linking Val Gardena, Alta Badia, Val di Fassa and Arabba-Marmolada. Or if history is your thing, you can follow the Giro della Grande Guerra around some of the most famous peaks in the Dolomites and see the ruins left behind from WW1. The Dolomites is also home to the Armentarola piste, which is better know as the Hidden Valley. The red run is ranked as one of the world's most beautiful, leading you through a charming valley with craggy mountain faces and steep ice falls down towards Sass Dlacia. The Lagazuoi cable car takes skiers up to a height of 2,752m where the 11km ski run starts. Unbeknown to many, 100m from the cable car summit a small wooden door hides a ladder leading down to a small tunnel system left behind by the soldiers from WW1, where skiers can look out from deep inside the mountain onto the valley floor over a mile below. At the bottom of the slope, a horse and cart will await the skiers here to take you to the Armentarola ski lift, the entrance to the ski area of Alta Badia and back onto the Sella Ronda. Watch a 360° HD video from a skier's perspective of the famous Hidden Valley run. The Hidden Valley is a 20 minute bus ride from Cortina d'Ampezzo and an even shorter journey from San Cassiano or Armentarola which skiers can easily access from the Sella Ronda. Alpe Luisa /San Pellegrino: Careful attention is paid towards children in this resort, with three snow parks and lots of beginner slopes. Alta Badia: Situated on the Sella Ronda circuit, Alta Badia is made up of six scenic alpine villages and is home to the world class black run: the Gran Risa. The resort of La Villa is perfect for beginners, whilst Corvara is the most lively village with a few bars and restaurants. San Cassiano is another resort with fantastic restaurants, including two with Michelin stars. Alta Pusteria: Home to the steepest slope in Italy, the three peaks Dolomites ski resort offers a range of skiing, with 220km of cross country tracks. Arabba-Marmolada: Arabba is quaint and traditional Italian resort with direct links onto the Sella Ronda. It’s also the gateway to Marmolada; the "Queen of the Dolomites" which has not only the highest peak in the Dolomites (3,343m) but also the longest ski slope (12km). Cortina d’Ampezzo: A luxurious and glamorous resort with a good range of skiing. Cortina d’Ampezzo also has a wealth of off-piste activities such as boutique shopping and lively bars and restaurants. Valle Isarco/Eisacktal: Famously always sunny, this region offers open skiing mainly for beginners and intermediates. Monte Civetta: A small village steeped in tradition, which offers a smaller 80km of slopes with 25 lifts. Kronplatz: One large central mountain dominates the resort, accommodating skiing of all ranges. The resort has a traditional après scene with lots of shopping available. San Martino di Castrozza + Passo Rolle: A resort which is a paradise for those who love telemark skiing, free riding and snowboarding. Val di Fassa: Set beneath a beautifully wooded section of the Sella Ronda, the main town of Canazei has excellent restaurants and an Austrian style of après. Val di Fiemme: An enchanting resort which is best known for its cross country skiing rather than its downhill skiing. Val Gardena: One of the most popular areas in the Dolomites, with the best known resort of Selva having superb skiing and is located on the Sella Ronda. Every year it hosts the FIS Men’s Alpine Skiing World Cup on its treacherous downhill: The Saslong. Although not an extensive list we do have several chalets in the Dolomites. The Chalet Hotel Parc Victoria in Cortina d'Ampezzo is hugely popular and great value. It is located right in the heart of the town on the prestigious and pedestrian-only, Corso Italia. On the more luxurious side, the Pine Lodge in Selva and the San Lorenzo Mountain Lodge in Kronplatz both offer a hot tub, sauna and steam room. They were also listed in the 'Top 10 winter hotels, lodges and chalets for winter 2015' by Country & Townhouse, and winner of Italy’s Best Ski Chalet at the World Ski Awards 2013, 2014 and 2015. We also offer a range of hotels, right the way from friendly 3 star hotels to elegant 5 star properties. The family owned Hotel Rosa Alpina in San Cassiano is a particular highlight and is rated 9/10 by the Telegraph - "the quintessence of Italian mountain dolce vita". The hotel features a 2 Michelin-starred restaurant run by head chef Norbert Niederkofler and regularly attracts A-list celebrities. Getting to the Dolomites from the UK is relatively straightforward and flying is definitely the fastest and most comfortable way of getting there. Innsbruck, Verona, and Venice airports all serve the Dolomites with transfer times ranging from 1 hour 45 minutes – 3 hours depending on the resort and airport you travel to. Driving is an option but requires some effort and dedication; expect journey times of at least 11 hours and a €54 toll for return travel through the Mont Blanc tunnel. Travelling via trains from the UK to the Dolomites is a possibility but will involve multiple changes at stations in France, Germany and Italy. However, if you are determined to travel by train we recommend flying to one of the airports listed above, where there are many train services into the Dolomites. For the non-skiers, the Dolomites offer a whole host of activities to do aside from skiing. From more leisurely activities such as snowshoeing, tobogganing, and dog drawn sleds to the extreme of snowmobiling, kite skiing and fat-biking. Cortina d’Ampezzo has the Dolomites Astronomical Observatory where you can star gaze the night skies of winter atop one of the world’s most stunning mountain ranges. Almost every hotel in the region has wellness areas where you can enjoy sauna, Turkish bath, and spa treatments, so if you’re looking to relax and be pampered, then the Dolomites are the right place! Of course Italian cuisine is recognised as one of the best in the world, and in the Dolomites it’s no different. The region offers everything from 2 Michelin-starred restaurants to quaint mountainside pizzerias. Everywhere you go the food is bound to be great and in the Dolomites enjoying a long lunch on the mountain is equally as important as skiing. The Dolomites are home to some of the finest ski schools in Europe, and it’s not uncommon to find yourself being instructed by World Cup athletes, national instructors, trainers and those specialised in teaching children. Unlike other alpine resorts there tend not to be any independent ski schools, as usually only residents born in the region can become instructors. So instead, each resort has its own official scuola ski (ski school) which provides first class instruction for all ages. Many clients are wary of the erratic snowfall in the Dolomites, yet more often than not, the Dolomites receive more snow than the neighbouring Alps. If that’s not enough, over 4,700 advanced snow making machines cover an eye-watering 1,160km (97%) of piste. So no matter what the weather or what the month: December - April, there is guaranteed to be snow to ski on!